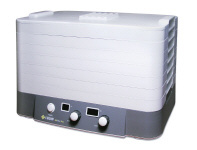 Lequip FilterPro Food Fruit Vegetable Dehydrator now with filter pro to clean the air! The L'Equip FilterPro Dehydrator is tastefully designed with your good taste in mind. 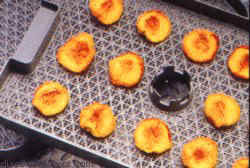 The most important aspect to dehydrating is the end result- more flavor. Properly dried fruits, vegetables and meats are flavor concentrated and enhanced. Consult the various tables to determine when food is properly dehydrated and ready to be stored. The L'EQUIP FilterPro Dehydrator carries a 10 year warranty. L'EQUIP is committed to manufacturing the highest quality, most user-friendly health appliances that not only perform well, but have a unique design to complement any kitchen. 6 trays included - 2 tall and 4 normal. 2 "fruit roll up trays" included. Undecided on which dehydrator to purchase? Take a look at our dehydrator comparison chart.